Fine grained sandstone with 25-50% matrix (making it a wacke). In this specimen the grains are small enough and the matrix abundant enough it can be difficult at first to notice the sandstone nature of the rock. We can only know by getting closer, a lot closer, to the rock. The gray color, darker in the actual rock than in this picture, also masks the composition. We have to saw cut the rock, and wet the surface to see the qfl. Lithic wacke sandstones, especially those containing feldspar are associated with regions of great tectonic activity. This specimen was eroded from a volcanic arc system that collided with eastern North America during the Taconic orogeny. It was deposited as a turbidity current in a submarine fan. A typical tectonic occurrence for a rock of this composition. A more proximal lithic conglomerate equivalent of this rock in Conglomerate #1. Sandstones like this come from incomplete weathering, rapid transportation, and rapid burial relatively close to the sourceland. 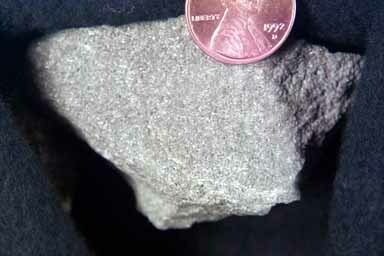 This rock (from the Ordovician Martinsburg formation) comes from a Bouma sequence (deposit of a turbidity current, an underwater avalanche) deposited in a submarine fan.